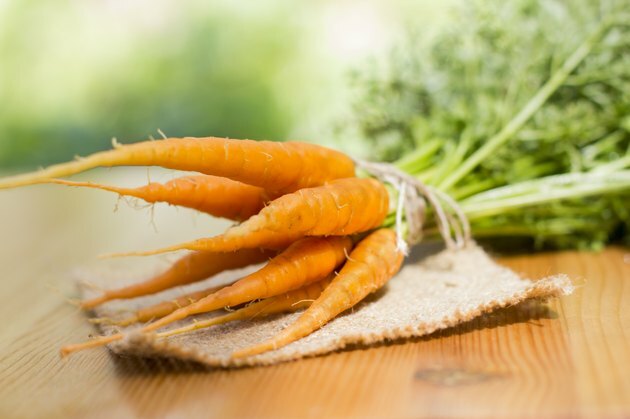 Nutrient-rich carrots contain folic acid, potassium, magnesium and calcium, but their store of beta-carotene makes them a particularly excellent source of vitamin A. These root vegetables benefit eyes and skin, and they also aid in growth and the body's ability to fight infection. Carrots are naturally sweet, so they lend themselves to use in desserts as well as savory dishes. They can be eaten raw, but if you like your carrots soft, a bit more work is required. Clean the carrots with a vegetable brush under running water. Peel the carrots lengthwise with a vegetable peeler, removing only the outer layer. You will lose some nutrients by peeling, but the carrots will taste better and be more tender. Cut large carrots lengthwise and remove the lighter-toned core, which may be tough in older carrots. Skip this step if your carrots are medium or small in size. Cut the carrots into small rounds to facilitate even and thorough cooking. Cut the pieces to the same size so that they will all cook at the same rate. Place the carrots in a saucepan and add just enough water to cover them. Add salt if desired. Bring the water to a boil, then let the carrots simmer for five to 10 minutes. Spear a few of the carrot pieces with a fork after five minutes to check their softness. If they aren't to your liking, let them boil a minute or two longer and check again until you are satisfied with their tenderness. Add a couple of inches of water to the bottom of a saucepan that has a tight-fitting lid. Insert the empty steamer basket into the pan to ensure that the water does not touch the bottom of the basket. Remove the steamer basket and bring the water to a boil. Fill the steamer basket with cleaned and chopped carrots or whole baby carrots, depending on your preference. Place the basket of carrots into the pan, checking again to be sure that the boiling water isn't reaching the basket. Cover the pan and let the carrots steam for 10 minutes. If cooking whole baby carrots, steam them for 15 minutes. Use a fork to check the carrots' softness. If they aren't soft enough, replace the lid and continue steaming them, checking them every few minutes, until they are as tender as you like.